Because the mouth is one of the most sensitive areas of the body, we go to great lengths to eliminate pain and discomfort associated with dental work. Anesthesia, both local and general, can achieve this during the actual procedure—but what about afterward while you’re recuperating? While a few procedures may require prescription opioids or steroids to manage discomfort after a procedure, most patients need only a mild over-the-counter (OTC) pain reliever. There are several brands available from a group of medicines called non-steroidal anti-inflammatory drugs (NSAIDs). NSAIDs like aspirin or ibuprofen work by blocking the release of prostaglandins into the body, which cause inflammation in tissues that have been damaged or injured. Unlike their stronger counterparts, NSAIDs have fewer side-effects, cost less and aren’t addictive. And unlike opioids NSAIDs don’t impair consciousness, meaning patients can usually resume normal activities more quickly. But although they’re less dangerous than opioids or steroids, NSAIDs can cause problems if taken at too strong a dose for too long. Its major side effect is interference with the blood’s clotting mechanism, known as “thinning the blood.” If a NSAID is used over a period of weeks, this effect could trigger excessive external and internal bleeding, as well as damage the stomach lining leading to ulcers. Ibuprofen in particular can damage the kidneys over a period of time. To minimize this risk, adults should take no more than 2400 milligrams of a NSAID daily (less for children) and only for a short period of time unless directed otherwise by a physician. For most patients, a single, 400 milligram dose of ibuprofen can safely and effectively relieve moderate to severe discomfort for about 5 hours. 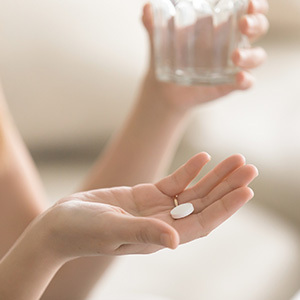 Some patients should avoid taking a NSAID: pregnant women, those with a history of stomach or intestinal bleeding, or heart disease (especially if following a daily low dose aspirin regimen). If you have any of these conditions or similar concerns, be sure you discuss this with your dentist before your procedure for an alternative method for pain management.